Aurélien Bory’s innovative piece explores the fading frontier between the technological and the human. 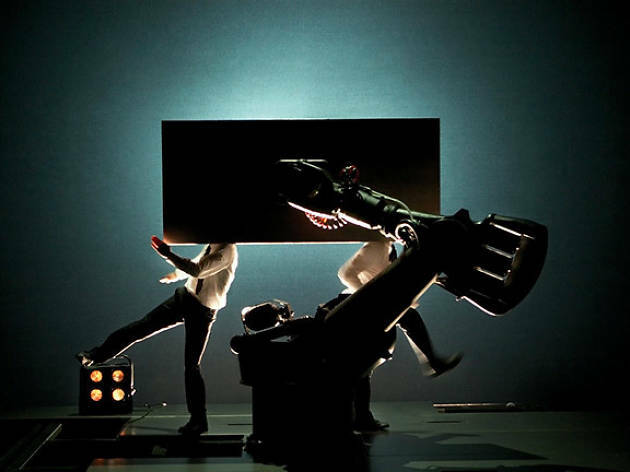 In Aurélien Bory’s troubling Wellsian vision, two dancer-acrobats compete with a massive robotic arm (the sort used to build cars), proving no match for its inexhaustible, mechanised rhythms. ‘Sans objet’ belongs to a growing genre of ‘physical theatre’, which – inspired by mime and theatrical clowning schools – imagines the performer’s body as a contested and dramatized site, combining circus techniques (acrobatics and pantomime) with the expressivity of contemporary dance. In many pieces, performers reckon with the limits and restrictions of their own bodies: struggling against fatigue or enervation before, finally, wearing themselves out. The director definitely has notions as to which way this contest will go. In his frenetic dystopian ballet, human and mechanical gestures compete for space and attention, although the two dancers’ struggle is ultimately ‘sans objet’, which is to say: groundless, irrelevant.